the past months have been a very exciting time. Our community has grown, we have put on a full circus show and the dates for leaving New Zealand are rapidly coming closer. Now all our energy is focused on getting our boats sea worthy. But first things first. When we came to New Zealand we were six people on one boat and some more people hitchhiked other boats from Panama. Then Lare joined our fleet in Whangarei. After working on her for a while Four Winds came up from Golden Bay and docked on as well. A week ago Plastic, a 28-footer, joined us so the fleet has amazingly grown to four boats docked. Parallel to the vessels our call was heard by many other enthusiasts around Aotearoa uniting almost 40 people. Our Circus Crew preparing the show. Busking in front of Countdown. At the moment we are spread across the city. The boats are docked in one place, our workshop where we fix our masts and sails is close by and the campsite that shelters most people is on the land of an incredibly generous lady with two donkeys and a talking magpie. We recently had a circle and gave focalising positions to people, trying to structure the challenges ahead across the group. 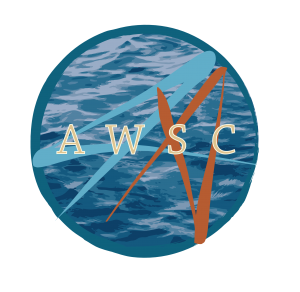 The main focus will now be on refitting the boats and doing everything that has to be done. We also now have more people working on the internet. This has been more difficult until now because our Internet-focaliser, as we call them, was not at the camp and work had to be organised over big distances. We will hopefully be able to reply to all emails and messages now, while updating more on what has been going on. At the same time we will have busking missions around town and the whole of Northland to collect money for our boat repairs and the places we will reach ahead like Vanuatu. 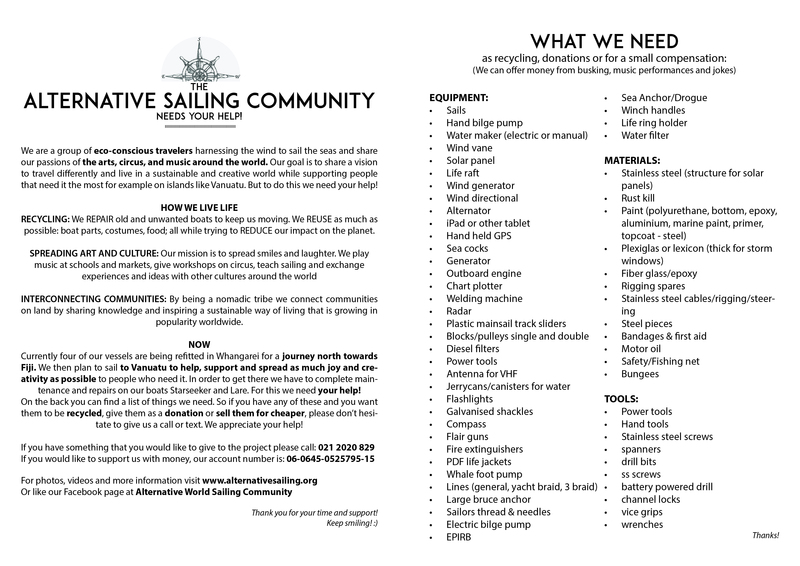 These missions will also give out flyers asking for things we need for our boats. These include tools and materials, as well as things for the rebuild in Vanuatu. At the recent circle we decided in a consensus that we will head towards Vanuatu after helping build the Rainbow Crystal Land in Fiji (What is a Rainbow Crystal Land again?). After Cyclone Pam many of the islands, as well as some remote places in the Solomon Islands, have been badly destroyed. The people there are lacking basic supplies like seeds, nails and water filtering systems. They are rebuilding their communities. The most basic items like diving-goggles or fishing-hooks can make a big difference there. We aim to bring as much gear as possible as well as putting up circus shows, workshops, permaculture gardens and all the other knowledge we’ve gathered. So if you are in New Zealand or know someone here that could have any of the supplies we’re looking for and would give them to us as a donation or a little bit of busking money please get in touch! It is essential that we now spread this list to get as many things as possible in the next month. The list below gathers everything we need. It is also here on our website. If you would like to donate money for our missions in Vanuatu and the Solomon Islands you can send us money either via PayPal or to our NZ Bank account. Please let us know and we will only use the money for buying the supplies that are needed. Oh yeah, by the way, we had a huge Circus Show at the Old Stone Butter Factory which was an even bigger success, the place was packed and we created an unexpected scenario full of endless smiles. A magical tale of 4 pirates that get stranded on a mysterious island, filled with acrobatics, fire, juggling, clowning and breathtaking music by all our talented musicians delighted a crowd of about 200 people! A video of the show is on the way and the photos are being developed. We would like to thank everyone who was involved (which was almost everyone) for their crazy efforts in making this happen. Family, things are looking bright but we are also facing big challenges. But no challenge is too big when you have smiles, hugs and beautiful people around you!